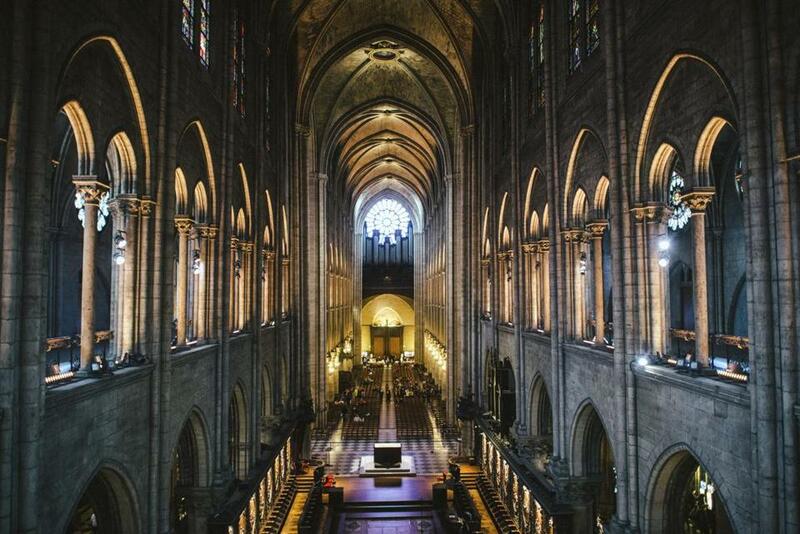 The interior of Notre Dame Cathedral in Paris, as pictured in September 2017. Paris’ Notre Dame Cathedral was heavily damaged by flames on Monday, much of one of the most famed examples of Gothic architecture — a building that has seen centuries of history and is a symbol of France. Construction of Notre Dame, which was built on the ruins of earlier churches, began in 1163, when Pope Alexander III laid the foundation stone. It took about 200 years to build, and wasn’t completed until 1345. Since that time, it has seen the coronations of Henry VI of England in 1431 and of Napoleon in 1804. It was vandalized in the 16th century by Huguenots and was used as a food warehouse during the French Revolution. It served as the backdrop for Victor Hugo’s 1831 ‘‘Notre Dame de Paris’’ (better known in English as ‘‘The Hunchback of Notre Dame.’’ The book’s place in French literature meant that calls for restoration were finally heeded in the middle of the 19th century — much of the current structure dates not to the 12th century, but to the 19th. But while the building itself is considered by many to be a work of art, the cathedral houses irreplaceable works of art, too. Some of it — reportedly including 19th century statues at the spire’s base — was taken out recently for restoration. Some was not. In the cathedral, there are statues: At the Mausoleum of Claude-Henry d’Harcourt, the lieutenant-general of the king’s armies who died at age 65 is captured eternally in a white marble sculpture from 1776. In the sanctuary, there’s a statue of Madonna and Child — one of 37 representations of the Virgin Mary in the Cathedral — that dates back to the 14th century (though it was only moved to the Cathedral in 1818). There are the paintings, like the 1648 portrait of St. Thomas Aquinas at the fountain of wisdom, and the divine ‘‘Visitation’’ from 1716.